France menswear 1817. Restoration Period. Home » France menswear 1817. Restoration Period. Coat with velvet collar. Waistcoat. Habit à Collet de Velours. Gilet de piqué. Journal des dames et des modes. 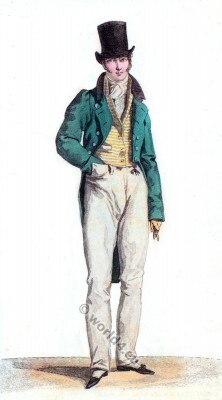 Costumes parisien 1817. France Empire, Romantic Era. Biedermeier era. Restoration. This entry was posted in 1816, 19th Century, Costume Parisien, France, Georgian period, Regency period, Restoration, Romantic Era and tagged France restoration costumes, Regency period, Romanticism fashion on 3/6/15 by world4.